I'm a big fan of Men's Health workout programs and own quite a few of them. The workout DVDs seem to be designed well as I feel they do work; especially if you're really breaking a sweat. A while ago, I ordered the complete DVD set of The Spartacus Workout. The Spartacus Workout was four DVDs, sold individually. I'm not sure if it was meant to be sold as set, but I ordered all four. 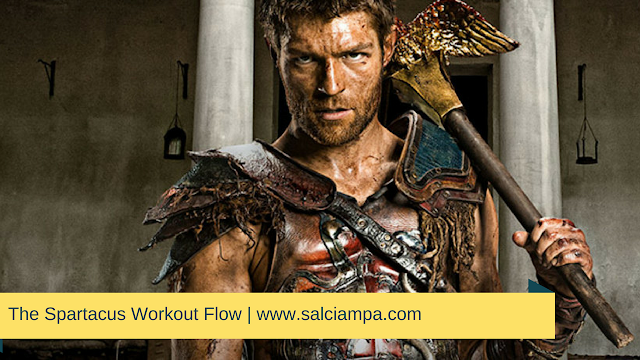 I was also expecting to find some sort of calendar or workout flow with The Spartacus Workout. Unfortunately, I don't think one exists. And I say that one doesn't exist because I've search and search and couldn't location such a calendar. And so i took it upon myself to put these videos onto some sort of order. The way I've broken down this flow is as follows, one day you work on a 30 minute routine followed by a 20 minute routine the following day. If you have a better way to organize The Spartacus Workout DVD set, please leave a comment below.